The toad hadn't moved, hadn't twitched, hadn't wiggled, not even once, not when she stubbed it with the toe of her new white sneaker, not even when she poked it with a stick. The flashlight in her hand held it there, its stubby hind legs splayed and frozen, its yellow eyes staring and round, a statue she thought, between the rock and the water oak, where she'd trapped it with the light just as twilight purpled them both. She dropped the stick, pulled the jackknife from her pocket, and considered her options. The pictures in her science book, the glossy transparencies that layered over each other, she lifted again and again, starting with the toad's bumpy skin, and turning pages through the multicolored digestive and respiratory systems, passing the reproductive organs, until she came to the toad's core, its tiny shovel-shaped skull and bent legs more resembling a bat than an amphibian, a primitive mystery of mechanism, motion. Her fingers sweated around the knife as she opened it, blade silvered, and she stared down at the toad's glistening eyes, skin muddy-green and dry as bark, and especially the curve of its neck, the image she had studied in the book, knowing that that soft stretch of skin would be the starting point, the place her knife would carve the X allowing her to find her way in, to see in three ancient dimensions. She knelt, the ticked point of her blade closing in, the hypnotic beam of light pinning the toad in place, paralyzing it completely, for exploration, she thought, to turn the pages for real this time. didn’t want to talk about Iraq, no matter how many hearty hands clapped him on the back, those same hands extended for shaking between strikes and spares, he picked at his cheese fries, gone cold and rubbery from waiting and listening politely to congratulations, his wife and new baby there with him, his wife’s faced creasing with worry whenever anyone said Iraq, so all the while he stared at his feet, the wall, the woman with the dark hair at the next lane, dodging the questions that came wrapped in good intentions, wrapped in praise and gratitude, but they came nonetheless, these nice people he swore to protect and serve, forever loyal, to the point of dying, they lobbed questions at him furiously, some he heard, some drowned out by Charlie Daniels on the jukebox, and still he threw ball after ball, his biceps burning as each question wound his arm further and further back--so what was it like over there? towel heads bad as they say?, pins exploding up and back like bodies falling, and the asking started again when he came back from the lane, he mostly just nodded in answer, never really saying anything about the tedium of the camp, the heat, the goddamned heat and sand, the Diet Coke he hoarded, the 120 degree porta-johns, Iraqis watching Oprah, this surreal bit of home, that never overcame the worst sound of all--the crack-boom in the distance that meant an IED or mine went off, the hang-there for a moment of his heart hoping it was a near-miss rather than a direct hit, the fact that he heard that sound every day, the second worst sound of artillery firing without warning, because ours sounded just like theirs when the howitzers are that close, no matter how many pitchers of beer they buy him, he can’t drown the day the battalion commander from 1st Battalion, 1st Marines handed him the dog tags of one of his Marines who had just been hit by a 60mm mortar, a great Marine, and how he was the one who brought the picture of the great dead Marine from where they’d hung it in the Intelligence Section back to his wife, he just wants to be here in a bowling alley in rural Virginia, near the little house where he grew up and near the lake where he lost his virginity and near the place where his daddy was buried, and he picks up a split, and everybody cheers at his deadly aim, and he nods and drinks and kisses his baby girl who coos in her seat now, safe and happy, and he ducks beneath the questions, lifting her to his chest, his scarred arms folding her in against him, and he smells soap and powder and the hint of the milk from his wife’s young breasts, and he breathes in that smell, knowing he has ninety days, only eighty-nine now, before he’s back in the middle of the night, on a dusty airfield, watching the better part of a battalion of Marines packed up and ready to go home after six months in al-Anbar, the relief etched in their young faces even in the moonlight, and as he files past loaded down with gear, he’ll exchange a glance with a similar grunt, a Marine like him, going home, they’ll say nothing. they’ll ask nothing, nothing needing to be asked. Copyright 2008, Mary Carroll-Hackett. © This work is protected under the U.S. copyright laws. It may not be reproduced, reprinted, reused, or altered without the expressed written permission of the author. 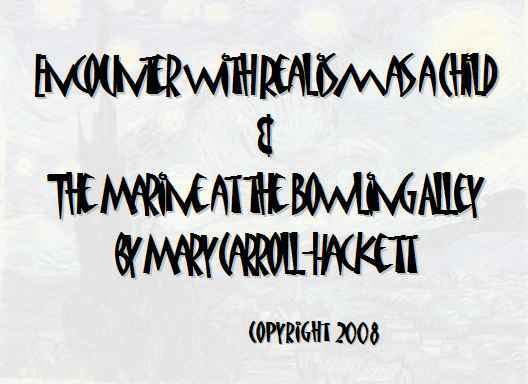 Mary Carroll-Hackett took the MFA in Fiction from Bennington College in June 2003. Her work has appeared in Carolina Quarterly, Clackamas Literary Review, and Reed, among numerous other literary journals. Her first book, What the Potter Said, was released in July 2005. She currently directs Creative Writing at Longwood University in Farmville, VA, where she also edits The Dos Passos Review and administers the Liam Rector First Book Prize for Poetry with Briery Creek Press.